Vice Dean of Accounting, Main Professor in the Academic Department of Accounting at Universidad del Pacífico and researcher at the Research Center of Universidad del Pacífico. He holds a Master’s degree in Business Administration (MBA) from the University of Texas at Austin (United States), and a licentiate’s and a bachelor’s degree in Accounting from Universidad del Pacífico. He has conducted several studies, consultancies, and trainings in the private and public sectors. He has extensive experience teaching undergraduate and graduate courses in Cost Accounting and Management Accounting. 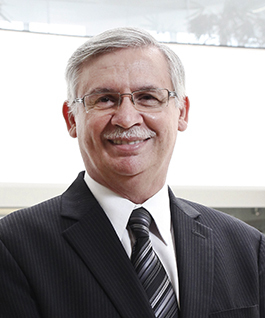 He has been Dean of the School of Management and Accounting, Director and Chairman at the Steering Committee of the Center for Management Consulting, head of the Academic Department of Management and Accounting, and chief accountant at Universidad del Pacífico. He is currently a member of the University Assembly. He was also responsible for the Project of Educational Technology at Universidad del Pacífico and representative before the Tuning Project Latin America. Cost accounting, management accounting, strategic cost management, among others.